There are currently hundreds of satellites orbiting the Earth providing services to support our increasingly technological society on the ground. Just one example of this type of activity is global communications, so that when we talk to someone on another continent by phone, our voices are almost certainly carried by a spacecraft in high orbit. But how are these satellites designed and controlled? What hazards do they face and how do they get into orbit in the first place? A new popular science book published this week aims to answer these questions, explaining the design and operation of spacecraft in an entertaining and readable way - without using complex mathematical equations. 'How spacecraft fly: spaceflight without formulae' is aimed at non-technical readers interested in spaceflight and spacecraft. Author Dr Graham Swinerd is a reader in spacecraft engineering at the University of Southampton with over 30 years experience in spacecraft and orbit design. His book explains orbits, orbital motion, weightlessness, and how spacecraft are designed and how they work. It also looks at the likely developments in human spaceflight in the 21st century, including future manned missions to Mars and space tourism. Graham says that we would find it extremely difficult to adjust to a world without satellites. "Our cars and mobile phones routinely come equipped with satnav; the weather forecasts we watch on our satellite TVs display images taken from space; observation satellites monitor the threat of global warming, and science spacecraft like the Hubble telescope have transformed our view of the universe. They have become fully integrated into our lives - even though we don't really notice that they are there." It was only half a century ago, in October 1957, that the small Soviet satellite Sputnik 1 went into orbit around the Earth to herald the arrival of the 'space age'. Just 12 years later in 1969, men walked on the Moon and since then almost all the planets in the solar system have been visited by robotic interplanetary craft. Space activity has become an integral part of our culture, with thousands of spacecraft being launched since Sputnick 1, both into Earth orbit and to far-flung regions of the solar system. Graham explains: "I wrote this book because I wanted to share my enthusiasm for all things 'space' which was sparked by an inspirational teacher when I was a small boy, and I have attempted to distil into this book all the knowledge and experience I have gained over my career in the space sector. "Most of all I have tried to explain how spacecraft work in a way that is accessible to people who are interested in space but don't have the scientific or mathematical background to understand all the technical books written on this subject." Graham Swinerd has many years of experience as an engineer, both in industry, working for a number of years at British Aerospace Space Systems, and as a reader in spacecraft engineering at the University of Southampton, supervising undergraduate projects and postgraduate research students. In addition to editing an award-winning technical textbook on spacecraft design, he has also published some 60 technical papers in refereed journals and authored numerous conference papers. 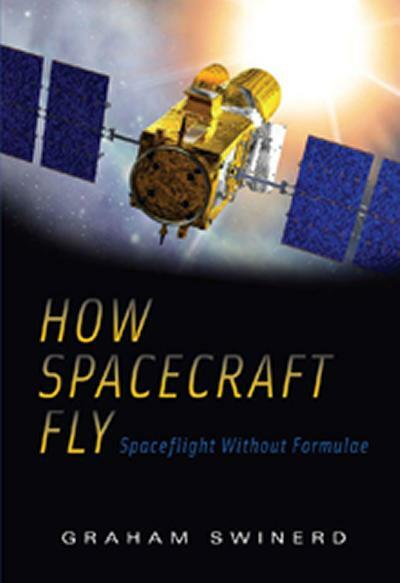 'How spacecraft fly: spaceflight without formulae' is published by Springer. Dr Graham Swinerd will be giving the keynote address at the 20th UKSEDS conference for students, professionals and space enthusiast, on 22 and 23 November 2008 at the University of Southampton. This annual event of the UK branch of Students for the Exploration and Development of Space (UKSEDS) is a forum in which delegates can exchange ideas with each other about Space, and includes an extensive exhibition. It is sponsored by, and includes speakers from, the University of Southampton; EADS Astrium; HE Space Operations; Vega; Selex Gallileo; Surrey Satellite Technology Ltd; British National Space Centre, and the British Interplanetary Society.